March’s Espionage Cosmetics Nexus has arrived earlier than expected, so that’s pretty awesome! As usual, both the regular Nexus and Literary Nexus are going up in this post, and the theme for March was, “Hidden Treasures.” Up first, standard Nexus! Veiled Paradise – A beautiful palette of blues and greens shimmer in what looks like some kind of underground paradise. The colors are SO stunning on this glossy nail wrap. Egg-citing Manicure – Glossy dragon scales and eggs are accented with silver foil and glitter. The pastel colors are just right for Spring and arrived just in time for Easter weekend! The Nexus Literary shipment is also on the same “Hidden Treasures” theme and produced two nail wraps that are wildly different from each other, but still perfectly on point. As usual, a themed bookmark is also included. The Hidden Garden – Definitely a nod to The Secret Garden, this glossy nail wrap features blue glitter on a field of flowers with purple foil accents on the text wraps. It’s a GORGEOUS wrap and I love how the flowers frame the tops of the text wraps as well. The King’s Roar – This glossy and glow-in-the-dark nail wrap references The Chronicles of Narnia with gold foil accents. This design is just too pretty with the greens and gold against each other. Every month, subscribers are allowed to vote on each set of designs, and the winner is sent on to regular sale on the Espionage Cosmetics website. The loser remains an exclusive wrap just for subscribers. Each shipment costs $15 per month on a month-to-month basis, plus shipping, and since the wraps each cost $10-12 online, the value of the shipment definitely exceeds the cost. Plus, there’s the fact that you get exclusive access to new nail wraps each month. In case you’re thinking about subscribing, check out the link below! Another round of Espionage Cosmetics Nexus is here! This month’s theme for both the standard and Literary Nexus was, “Voyages,” and having a husband who is a mariner, this was absolutely on point for me! Above is the standard Nexus shipment which featured two nail wraps, both perfectly on theme. Seashells & Starfish – It’s a pretty blue gradient background with pearlescent seashells and starfish printed on top. It’s a really pretty design and will be great for a vacation manicure. That’s Nautical – A glossy nail wrap with ropes, anchors, and ships’ wheels, this features a pretty silver foil accent in the design. Again, I think this one is going to be brought along on vacation this summer! Nexus Literary this month on the same “Voyages” theme, featured two nail wraps that may be in my top 10 of all time. I love that they include a bookmark every month with the Literary subscription too. I’ve really been loving the Literary subscription – it’s such a great book nerdy addition to the Nexus lineup! Odysseus’ Journey – Well I think it’s obvious this refers to the Odyssey by Home, the classic Greek epic poem. I’m so in love with the color palette on this between the silver accented words and the wave design. Voyages Extraordinaires – Another great fit to the theme, this design is based on the book of the same name by Jules Verne. Tentacles frame the top of a few wraps with bronze accents on some of the words, and the accent wraps are blue waves with glitter. Each shipment costs $15 per month on a month-to-month basis, plus shipping. An online vote goes on to pick the winner of each shipment which then goes on to fame and glory for regular sale on the Espionage Cosmetics website. The wraps individually cost $10-12 online, so the value of the shipment absolutely exceeds the cost, plus the ‘loser’ after voting each month is an exclusive that won’t be available to the general public. There’s also a chance to add on a booster pack exclusive nail wrap that goes along with that month’s theme which I didn’t do this month (because I forgot, oops!). In case you’re thinking about subscribing, check out the link below! 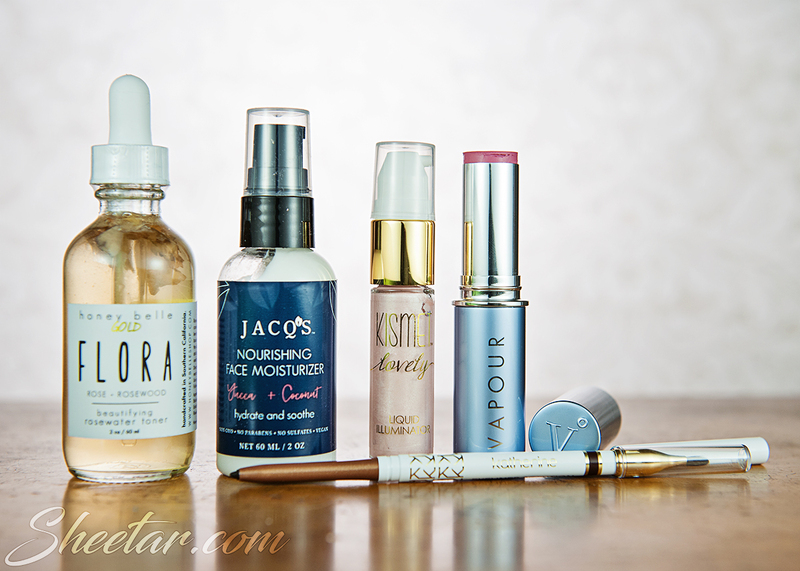 March’s Benevolent Beauty Box is here! It’s another great box with a wide variety of products and I’m eager to try everything as usual. Terre Mere Charcoal Blenders – 1 set / $44 – (Product is full size) Probably one of the most high value products I’ve seen in the box yet, the set of two charcoal blenders in different sizes is pretty neat. I’ll admit that I don’t use foundation ever really, but it looks like these also work well for primer and powders, so I’ll have to give them a try. That little one looks like it might work really well for concealing my perpetually-exhausted under-eye circles. 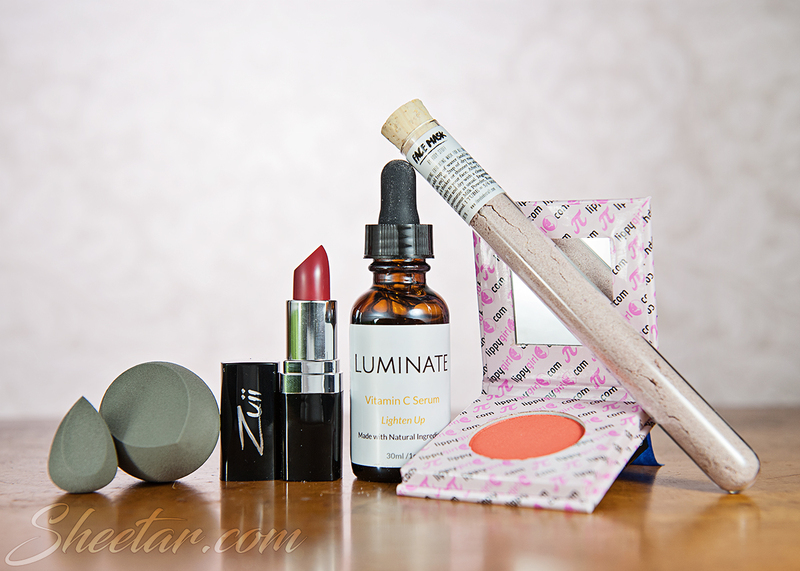 Zuii Certified Organic Flora Lipstick – 4 g / $27.50 – (Product is full size) I received the color “Charm” which is a really hard color to describe – almost a pinkish brick red? The color is buildable, so it goes on sheer at first and works into a more opaque color with each extra coat. The verdict is out on the color for me so far.. I think it might work better once my skin has had a little exposure to the spring and summer sun. But, I do like the rich and moisturizing formula! Luminate Vitamin C Serum – 30 mL / $19 – (Product is full size) This is a super thick serum with hyaluronic acid, vitamin c, and jojoba oil which my dry skin loves! For being such a thick, gel-like consistency out of the bottle, it disappears into my skin nearly instantly, leaving behind no oily residue. LippyGirl Pipod Pressed Mineral Blush – 3 g / $25 – (Product is full size) I received the color “Tangy” which is a really orange tone for a blush, so I doubt I’ll be able to use it as a blush. But hey, any pressed powder also doubles as an eye shadow, and I really do like the color on my lids since the peachy tone brings up the greens in my hazel eyes. It’s got a golden shimmer to it as well which will make it perfect for summer eye makeup. Body Stuff Face Mask – 12 g / $7 – (Product is test-tube size) This mask is packaged in a neat little test tube and arrives dry so you can add your favorite liquid to it (honey or yogurt for a real treat, or plain old tap water works fine too). I haven’t tried this yet, so I can’t report about how it works, but I love the unique packaging and of course, a mud mask is something I’m always happy to see in boxes! The total value of the box comes to $122.50 which is a great value for the cost of $29.99 on a month-to-month basis. Even if the blush color doesn’t really work as a blush for me, it makes for a really great eye shadow color, so there’s really nothing in this box that I won’t use (one way or another). I think the big winner for me is the serum because my skin is just perpetually a desert, and I was pleasantly surprised at how quickly it sunk into my skin for being such a thick gel. As always, looking forward to the next month!